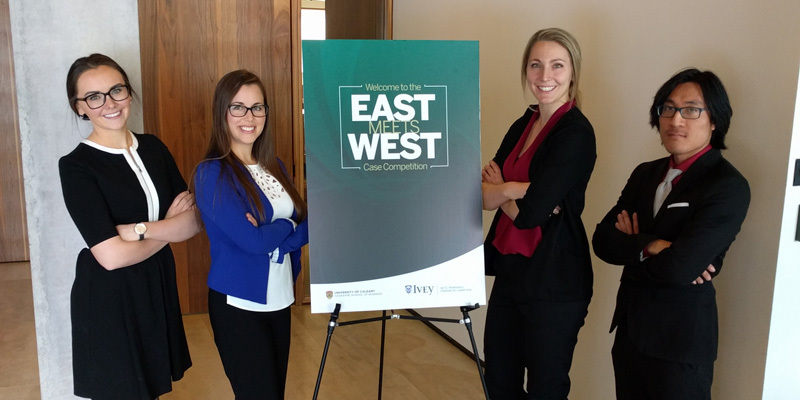 The 2017 East Meets West Leadership Case Competition took place in London, Ontario, hosted by Ivey Business School at Western University. 11 universities across Canada sent top MBA students to compete and collaborate this past February. The third annual event is a partnership between the Ivey’s Ian O. Ihnatowycz Institute for Leadership and the Canadian Centre for Advanced Leadership in Business at the Haskayne School of Business, University of Calgary. The competition challenges team members to work through live business cases while balancing the fiscal demands of a good business with the ethical demands of good leadership. Over the span of the competition, teams participate in two styles of case competitions: mixed teams and University teams. The focus of each case is centred on a recent real-life problem faced by a Canadian business. This year students were tasked with developing solutions for the City of Calgary in Alberta and the Stratford Festival in Ontario. After each case, teams are provided with a debrief presented by the organization's leader, followed by a networking opportunity. Each team also received feedback from a panel of judges made up of experts from both academia and industry. Four students from the Edwards School of Business MBA program represented the University of Saskatchewan: Kendra Wack, Ashley Dekok, Brittany Melnyk, and Timothy Tong. The team greatly appreciated the opportunity to learn from and collaborate with MBA students and industry leaders across Canada, as well as the chance to practice and apply both business and leadership skills to real-life scenarios. Special thanks to the Grandey Leadership Initiative and the Edwards School of Business for financial support.